This recipe is probably the best tasting carne asada I've ever made. Very flavorful and just enough of a little kick. I didn't follow the entire recipe (found HERE) because of time and a lack of ingredients, but the marinade I made came out wonderfully. I grilled the meat and heated up the tortillas on the BBQ. I don't like really spicy things but this was great. The chili pepper did get a little bit much after one taco but I think if I add guacamole or sour cream next time it will be perfect. Mix all ingredients, except steak, in a large bowl. Add meat and let marinate 1-3 hours. Grill until meat gets a nice brown carmalized char. 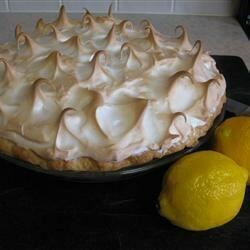 Lemon Meringue Pie has got to be one of my favorite summertime desserts. Cool, refreshing, sweet and tangy. Think they're hard to make? Think again. They are really pretty simple. The best part is being able to adjust the lemon juice based on your tang preference. The recipe posted has a fairly average lemon tang, I usually add more than what it calls for. But that is totally up to you. Father's Day was full of surprised for Chad. As far as he knew, he was just going to a brunch at his Dad's house. Little did he know ;) About two hours into the brunch, my brother Isaiah - who has recently bought his own limo - arrived to chauffer the dads around for a wine and beer tasting. A great time was had by all! I'm so glad everyone had fun. We tried some great beers and well as a new fabulous winery. Thanks Per Cazo! After our wine tour, I whisked Chad and the boys off to Morro Bay to stay the night at a really cute Beach Bungalow. Then breakfast in the morning and an afternoon at the beach. Perfect weekend. I am the maker of the Green Stuff. A few years ago, Chad described a cold summer salad that his Aunt always used to make. Green, nuts, pineapple, marshmallows..... I had never heard of such a thing, and wasn't sure I cared too. But thanks to allrecipes.com and their awesome ingredient search function, after some searching I had found it. 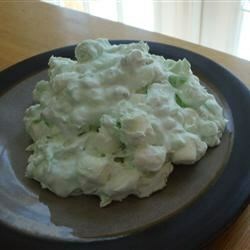 It was really called Watergate Salad - not to be confused with Waldorf Salad. Now there is an unspoken rule that I bring the Green Stuff to all family functions. Seems I have assumed the duty that was once his Aunt's, and happy to. This salad is super easy to make, cool and refreshing. The ingredient list may sound like it won't go together, but trust me. It's yummy! In a large bowl, mix together pudding mix, pineapple with juice. Stir in marshmallows, and nuts. Fold in whipped topping. Top with chopped nuts if desire. Cover with plastic wrap and chill. Anyone who knows Keegan, knows that he loves all modes of transportation. Especially anything that he gets to ride in/on that isn't his moms car. Cars, trucks, trains, planes, motorcycles, you name it. His Uncle Toby owns a motorcycle and was more than happy to give a squealing toddler his first motorcycle ride. It was just around the block but the smile on Keegan's face when he came back was bigger than the helmet on his head. To celebrate Memorial Weekend, we decided we wanted to go camping. However, we didn't want to deal with crowds and chasing two kids around in them. So we opted to campout in our backyard! Perfect solution, well was perfect until the over zealous golf course sprinklers came on. Good thing we put the rain cover on! So we pitched our huge tent in the backyard, inflated our air mattresses, the slip and slide and our pool. We set up the pack n play in the tent and a mini weber grill to be our bonfire pit. All the fun of camping plus all the comforts of home just a few steps away. The boys had a great time. And trying to eat it all in one bite.